Property Location With a stay at Comfort Suites Oakbrook Terrace Chicago in Oakbrook Terrace (Lombard - Oak Brook), you&apos;ll be convenient to Drury Lane Theater and Oakbrook Center Mall. 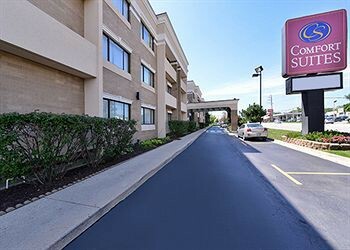 This hotel is within close proximity of York Woods County Forest Preserve and Yorktown Shopping Center.Rooms Make yourself at home in one of the 103 air-conditioned rooms featuring refrigerators and LCD televisions. Complimentary wireless Internet access is available to keep you connected. Conveniences include phones, as well as complimentary newspapers and microwaves.Rec, Spa, Premium Amenities Take advantage of recreational opportunities offered, including an indoor pool, a sauna, and a 24-hour fitness center. This hotel also features complimentary wireless Internet access, a fireplace in the lobby, and a television in the lobby.Dining A complimentary buffet breakfast is included.Business, Other Amenities Featured amenities include a business center, limo/town car service, and express check-in. Planning an event in Oakbrook Terrace? This hotel has facilities measuring 700 square feet (65 square meters), including a meeting room. Free self parking is available onsite.